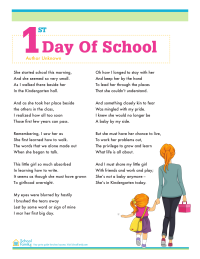 Print this sweet and inspiring poem about the transition to kindergarten for back-to-school gatherings (like boohoo/yahoo events) or other occasions, or simply to mark your child's transition to kindergarten. Versions for boy or girl included. 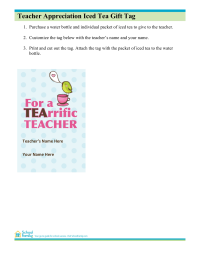 This tag says "For a TEAriffic teacher!" and can be customized with any teacher's or staff member's name. Print out then attach a tag to a bottle of water and individual packet of iced tea during Teacher Appreciation Week. This tag says "Hands down, you're the best teacher around!" and can be customized with any teacher's or staff member's name. 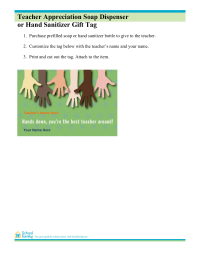 Print out then attach a tag to a prefilled soap dispenser or hand sanitizer as a small gift during Teacher Appreciation Week. This tag says "You're a CUT above the rest!" and can be customized with any teacher's or staff member's name. 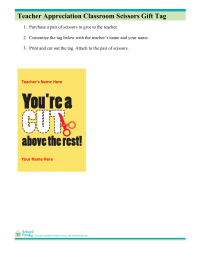 Print out then attach a tag to a pair of scissors as a small gift during Teacher Appreciation Week. This tag says "For a very POPular teacher!" and can be customized with any teacher's or staff member's name. 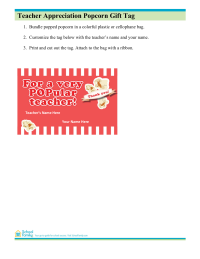 Print out then attach a tag to a bag of popcorn as a small gift during Teacher Appreciation Week.